By the law of karma, bank holidays in rural Wales are awash with grey clouds. Particularly summer ones, but not this one. 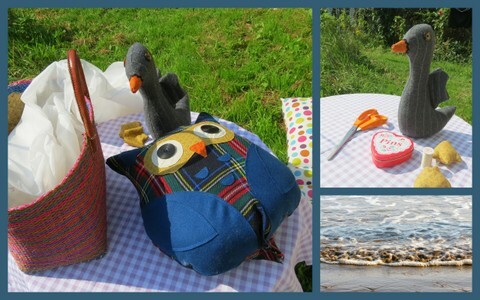 This weekend has been wall-to-wall sunshine - great for photos, for al-fresco sewing...for baking. I have gone through more butter than I care to remember, with a lemon drizzle cake and chocolate brownies. When my son goes back to uni next month I will miss the baking. Lemon drizzle...the taste of summer. Saturday, via a vintage fair for fabric and china, I found myself in a funfair - or rather three rides, three stalls and an oversized sandpit. But there was a very photogenic helter-skelter, and a big wheel. I loved the helter-skelter, and have fond childhood memories of sliding down on a scratchy coir doormat, over and over again. I particularly like this shot of the big wheel, which has a magical quality of a bygone age. I have just listed it as a print in both my folksy shop and Etsy store, and am working on a set of greetings cards. It was fabulous weather for the bank holiday! That lemon drizzle cake looks delicious, yum. Might you consider sharing the recipe? Will do - it's the best recipe for lemon drizzle that I've tried. Most of the recipes I use are from BBC recipes online, so are easy to add a link, but this one is from a proper, retro, hardback book. Snoozy fox - inspired by a very snoozy cat. Mañana, mañana. The quirks of rural living.